The GFX is a great MF camera, but the included neck strap is not. Given the apparent nonstandard means of attachment, I wonder if any users have found an alternative, as I have searched and, so far, have come up empty? Well I have reverted to using my Peak Design Slide. Apart from my slight doubts about the weight and strenth of the anchors. No problem and it is much more comfortable. Thanks for the suggestion, I'll take a look at their strap. I've just visited the Peak Design site and viewed the two available strap styles. 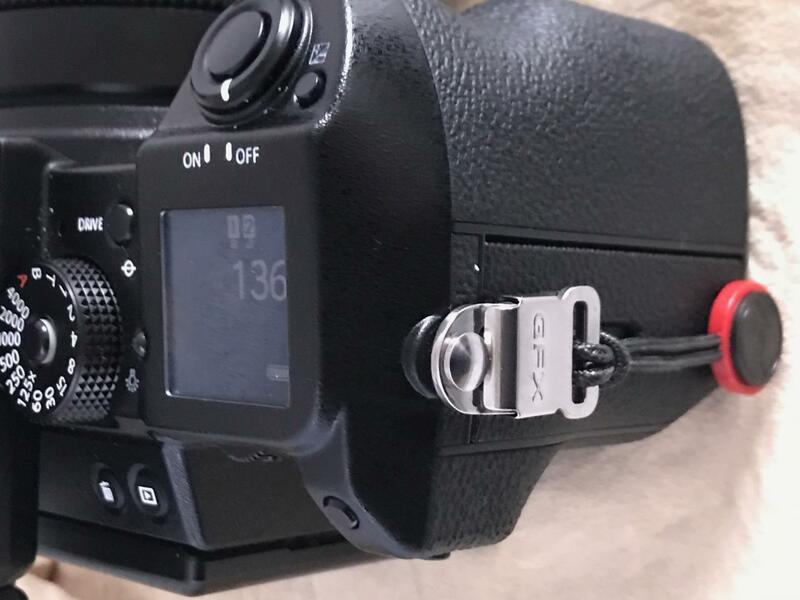 The site video, however, appears to show the attachment of the strap to the camera's eye-lits, where as the GFX has a different mounting situation. How did you manage to attach the Peak strap to your GFX? The GFX attachment points have a plastic insert as well, those were put in at the shop they said it is better that way. Otherwise fitting the slide is no more difficult to attach than on an X-T2 which I did own. I was hoping to eliminate the original GFX clips that I already have installed with the plastic inserts, however, the attachment depicted in your photo appears to be a viable alternative. Thanks again. I'll place an order for one. I would also prefer a more 'normal' camera anchor point, especially as on the GFX it gets in the way of the SD card door! Which is a minor pain until one gets used to it. Otherwise the camera is just sublime. I have just got a Godox AD200 and was testing it out today this one is a heavy cropped image. 1/1000 sec, F2.8, 63mm lens, ISO 100, Flash power set at 1/128th on a grey but fairly bright day. Love the way the drab balcony floor is just a lovely blur. I agree, the 63mm is a great hunk of glass ... I use it most of the time. But I am also very enthusiastic about the 120mm with OSS. By the way, I was about to order the neck strap, but found that it was out of stock at most resellers. I subsequently came across the "Fotostrap," https://fotostrap.com/collections/featured-products/products/dutch-1) which has an all leather attachment at the camera side that, to my eyes, appears more sturdy than the laniard used by Peak Design. Thanks Ron. Had a look at this strap, it looks good, but I am not so sure about the metal parts (buckles in particular and the LCD screen at the back when being put into a case - especially as I have yet to see a MAS glass screen available. One thing I do like about the Peak Design Slide is that I can detach it easily! I have taken to removing it when packing into my case. There is less risk of scratching the screen. I like the 63/45/110 lenses. The zoom is also OK. I am not used to zooms, but it does take great images too. 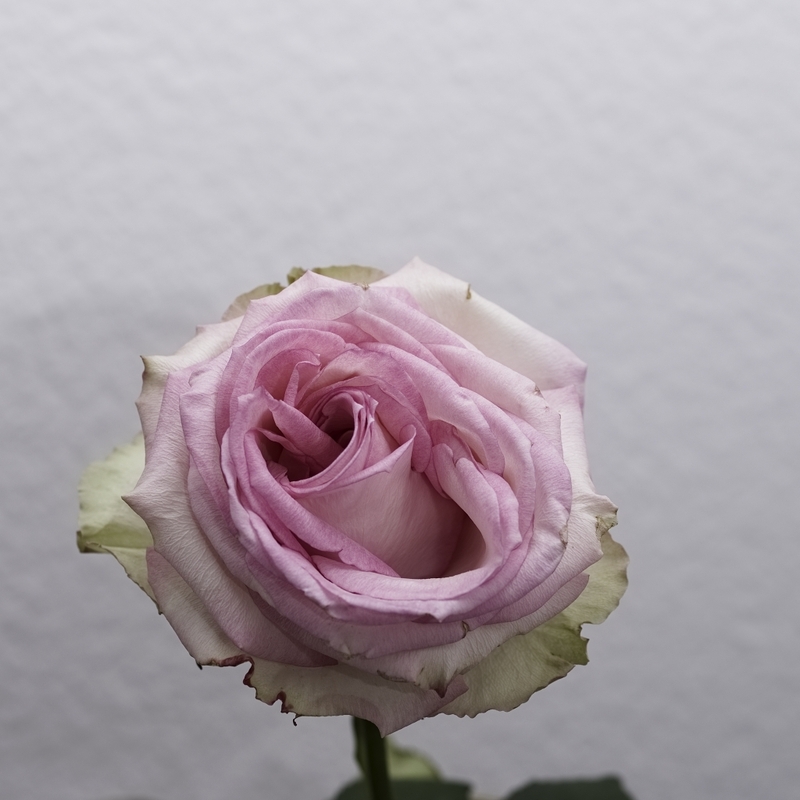 The rose image attached was taken with similar settings, again taken in a cluttered area, so heavy crop. As for the strap and metal buckle, I guess it depends upon the case you employ. Like most people, I've got a storeroom full of discarded camera bags that include the somewhat coveted Billinghams, which are a major nuisance to use on a daily basis, but are great for storage. More recently, I've purchased an oversized messenger style bag made by Lill-E that allows for easy removal of the camera and accessories while the bag is shoulder carried. As for the strap, I tend to drape it over a divider and drop the bulk of it into an available, open space. It looks like the Fotostrap buckle is far enough away from the camera to avoid touching the LCD while in the case, or while carrying, but that remains to be seen. I am fairly OCD about my equipment, and when i have sold, even years-old cams—and there have been many— they've been in like-new condition. So I will be certain to evaluate the strap to consider your concern. Unfortunately, it cannot be returned, and if there's a problem it will likely end up sleeping with my stash of bags. There are numerous other manufacturers of GFX glass screen protectors on the Net. BTW, I meant to ask, are you satisfied with the Godox? I have only had the Godox for 3 days, and already I can envisage getting shut of my Elinchroms and using the Godox gear inside and out. The trigger took a bit of getting used to but otherwise in either TTL or Manual mode high or low shutter speed I am thrilled with the results. The less said about camera bags the better, I also have a dusty collection! Including the most used one a Hadley Pro, I had a clear out a couple of years ago. The main bag now is a Peak Design Everday Slink, which fits a GFX with 63mm and the 45mm or 63mm and 110 or 45 and 110, spare batts, my 100F and a few other bits. My gear when part-exchanged is like yours like-new condition. Prently I take the strap off if I'm at home in studio. If I go out, then strap goes on, in the bag I just am careful to keep any metal part away from the screen. Thank you for the screen protector link I will take a look. Screen protector looks good, I will try and source it here in Switzerland. Let me know how the screen protector works out in terms of clarity, etc. The one I have fitted to my 100F and the X-T2 which I just sold was the MAS Magic LCD Screen Protector. The very first one even I can fit easily, without bubbles and forget about. They are that good. I have been waiting for them to release a GFX version as I know the brand and how easy it is to apply for myself. Thank you for the info, I will keep an eye out for that brand. Let me know if it works as desired. Btw, I meant to ask your dog’s breed. He or she is magnificent. Well if the animal was alive he or she would be a Poodle, my favourite breed, especially the largest variety (Standard Poodle), this one though is a dye cast model of the real thing. Dye cast model? I had considered that possibility, because I have never been able to convince a dog to sit that still for a photo of that quality. That said, it is great reproduction. 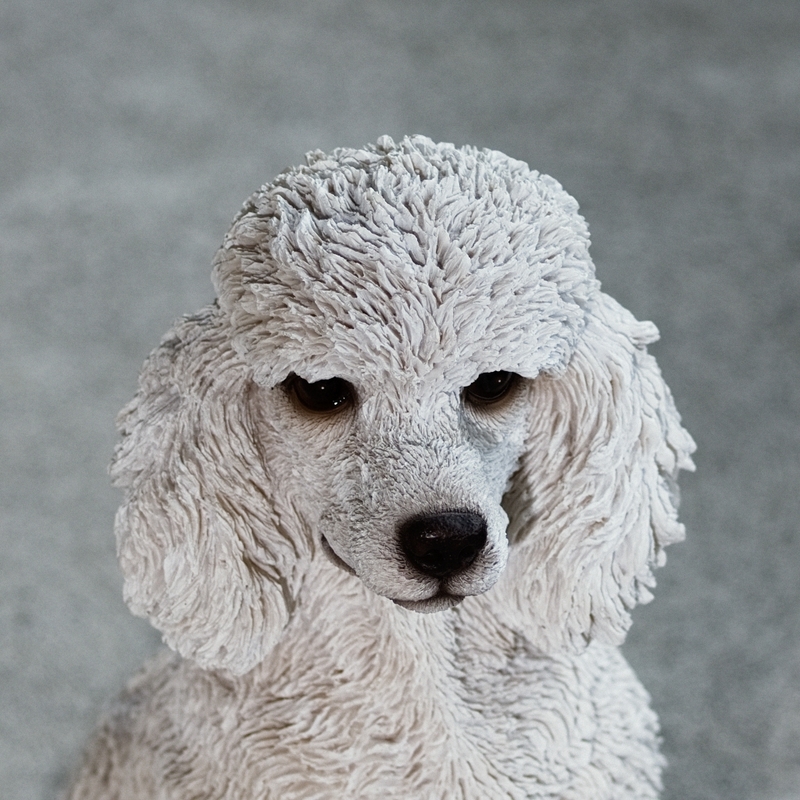 Standard Poodle's make great, loyal pets. Indeed we had in my childhood from a young ages 3 Standards, all different in character but so much fun and very loyal. One certainly needs patience for dog photography that is for sure! Yes, I've basically given up on pet photography, as I'm tired of cleaning dog drool from my lenses. They seem to comprehend the command "look here," as "lick here". Not sure what the weather is like in Switzerland right now, but here in South Florida it's beginning to warm up, and that means condensation on lenses when leaving an air-conditioned environment. Ah the benefits of a filter........I see that you have not lost your sense of humour! That's important to keep in this life. It is slowly warming here too, but thankfully we don't normally need air-conditioning, and definitely in our place there is none. The air is dry too so condensation on lenses has never yet been a problem. Here is one example from the late seventies. Originally a slide taken I think probably with a Canon. 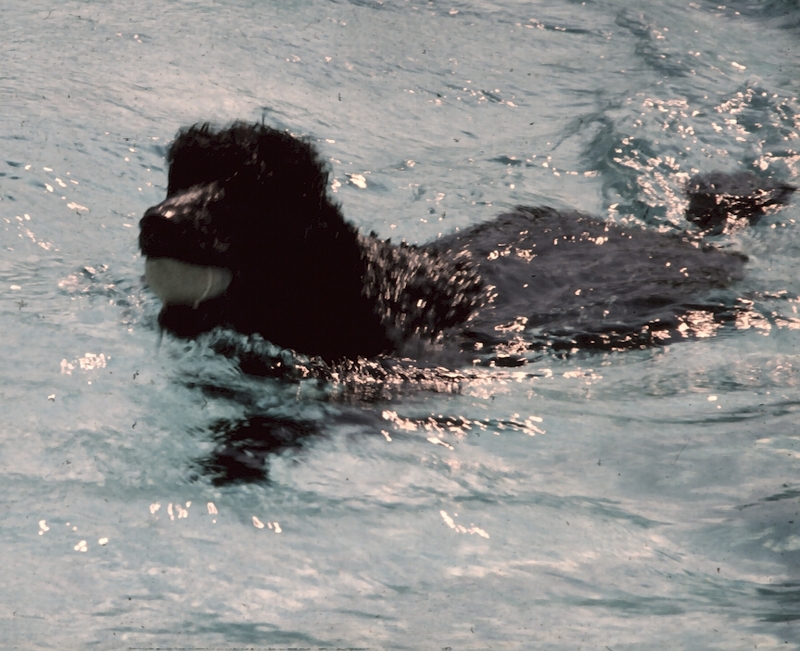 Cindy was a real character, couldn't keep her out of water to fetch a ball or a human! When I approached the pool she would start barking, as soon as I was in the water she would be wittering and following my every movement and gauging where she should jump in to save me. Once I dived in and as poorly as I can see under water, I could sense a black shadow above me. So I am coming up from my dive, Cindy has ran around the pool tracking me. Then boom I surface and she lands on my neck and is trying to 'save me' by 'nibbling' at me. I of course was not very pleased, but afterwards I could see the funny side of it! Thanks for a chance to view your envious dog/photo collection. My older slides are currently inaccessible, as I have recently moved to a new location and the transparencies of yesteryear were stored—in no particular order—in large boxes. Finding one specific image would take weeks. Thankfully, the digital world has eliminated the archival problem. Your weather sounds great. Some time ago, I resided in Northern Italy, where the climate went from hot and humid in the summer months to snowy, damp and cold in the winter. But I have been in South Florida for 41 years and have become accustomed to the heat and humidity of the subtropics.